Alderton is a busy little village where the roads come together out on the Bawdsey Peninsula. St Andrew is almost entirely the work of Arthur Blomfield, the 19th century architect. He seems to have spent an uncommonly large amount of time in the county of Suffolk, and his work extends from the vast, urban St John the Baptist, Felixstowe, to the tiny chapel in the woods on Culford Heath. Much of his work in the county was restoration stuff, and his hallmark is the mystical, rural archaism of Early English/Decorated Transitional. My first sight of St Andrew was accompanied by a shock of recognition, for here is Blomfield's work in all its glory, a crisp exterior in a pleasant setting, with a pub garden that cuts directly into the churchyard. The oddest thing about the church is its tower - or, rather, the absence of one. 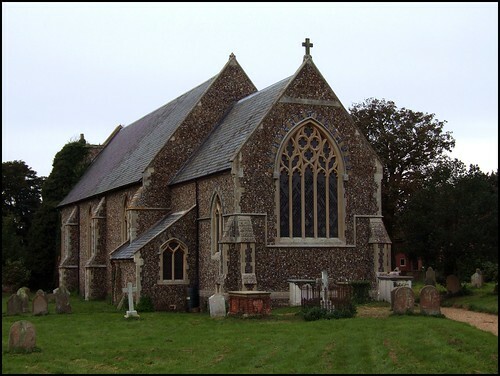 As with much of this area, the wealth and activity of the early medieval period were replaced by later depopulation and poverty, so that, as with Bawdsey a mile away, this church was soon crumbling. The tower fell progressively during the 17th and 18th centuries, then achieving its present state one Sunday morning in 1821, when it collapsed during morning service, killing a cow. I understand that the cow was outside the church at the time. The ruined tower is most splendidly overgrown, full of ivy, angelica and elder, and there's no other Suffolk church like it. The Millennium project was a little turret for the bell, which now stands just to the west of the tower. For many years, this bell sat on the floor of the nave. A more ambitious, and slightly tongue-in-cheek, project suggested for the Millennium here was to rebuild the tower - perhaps inspired, or even provoked, by the vast amount of money about to be spent on building a tower at the Anglican Cathedral in Bury. The great survival of the church is the late medieval north porch, which, although battered and truncated, retains a Suffolk Wild Man stalking a Dragon in the spandrels, and Marian monograms around the base. The porch must have been huge before it lost its upper storey. I stepped inside to the a substantial, light, open nave. As with Bawdsey and Hollesley, this church must have been a big one before the rot of poverty set in. The interior is thoroughly Victorianised, if not urban and anonymous; but Blomfield retained some of the memorials from the pre-Restoration church, and there is an interesting one to Robert Biggs, a Rector of Alderton and Bawdsey who died in 1769: He was not distinguished by his Activity or literary Abilities, But he was what is more truly valuable, An honest Man. Amen to that. The War Memorial is a marble slab set in an 18th Century-style wooden frame - I don't think I have seen another one like it. It is large, as you'd expect in a coastal parish which sent many young men off to the Navy as well as the Army. Poignantly, it slightly misquotes the famous line from Kipling: Ye who live on midst English pastures green, Remember us, and think what might have been, suggesting that it was recalled from memory. Blomfield also left in place the piscina in the south wall, but the chancel is all his typical ritualist ordering, designed for for a style of worship now rather out of date, although when I was here about eight years ago, the lady cleaning the church assured me that it flourished at Alderton, and that there was a strong musical tradition here. Most curiously, Blomfield installed what appears to be a mock Easter sepulchre in the north wall, possibly for use as a credence, but probably just because it looked harmonious. When I was here before, the west end was anything but harmonious, with a partition screen cutting the church off from the ruins of the tower, and the tower arch looming in an alarming manner above it. Today, this end is home to a raised stage, giving the church a dual purpose, depending on which way you are facing. What a splendid idea! Splendid, too, to sit outside the Swan, gazing over the top of a pint at the depredations of time, and Blomfield's masterly restoration.